Register Log In GliderCENTRAL Forums Bonding & Relations Bonding & Relations 101 Tent Time How often during the week do you get your suggies? How oftenn do you get them out? Every day? an how bonded are they too you? Last edited by Shay; 11/19/11 02:57 PM. I have 9 cages. All my suggies are friendly but some are much friendlier then others. I have no trouble handling any of my gliders but some like it alot more then others and a few LOVE strangers and like to show off so those are the ones I get when I go out places. I would say it really depends on the person secdual i am astay at home mom so i have about 1-2 hours aroun 12pm every evening so i have to devide that between 4 cages which 2 of them arent completely bonded to me. I make sure they all get attention everyday because its good for the relationship to keep gowing. I cant get them out once my kids get home from school because its to hecktic and they will open the door to the glider room 10 times ill let them come in but they get board,so i decided to only do it when there at scholl and then at 9 every night after all the kids are asleep we play alittle before dinner. Just find time everyday to show them attention and i think it will be plenty of time. Most of all Very Happy Hubby! RIP Twix i miss u!!! My monkeys get out every night and every morning. Our night time play varies from 15 minutes to 2 hours, depending on how tired I am. If they get a short playtime in the evening, they get a long one in the morning before bed. Yes, I have a good relationship with each one of them. I keep mine on me pretty much all evening when I'm home, until they start waking up. I can't seem to find my tent after the move, but when I do, I'll be able to have play time with them again. It's not every day, since I have night classes on Wednesdays and usually work late Saturdays. Also, my boyfriend carries them around while he's home during the day. He's kind of like a stay-at-home dad until he can find a new job! Two are bonded pretty well, one is still getting there, one hates my guts after all the recent vet visits, and one is still new, but is the sweetest glider in the world! My suggies get out at least every other night to play for a few hours. I do have the favorites that spend all day with me. Right now daisy is ALWAYS with me at least 14 hrs a day. Boo and Casper are our new leu babies and they spend a good 6 hrs a day with me. Neither of them is adventurous enough to play in the glider room yet though. While mommy and daddy play they usually snuggle with me. 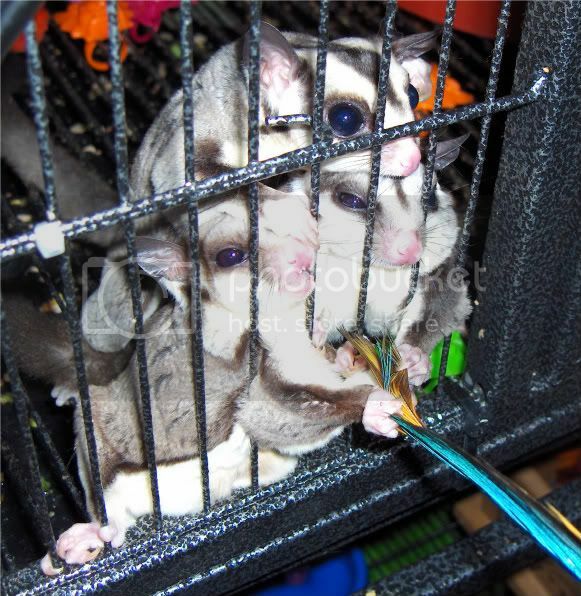 While I have these 3 little ones with me all the time i alternate the other gliders to pack in a bonding pouch every day. Frosty and snowball love being with me, but tundra does not like being packed at all. Lulu and Prince are npot very fond of being held or packed but will come out in the glider room and play and jump on me as long as I'm not the one making the initial contact. Tinkerbelle and tucker and very bonded and I can take them anywhere. they will let others pet them and never object as long as i am holding them still. My baby Daisy is the most bonded. She was hand raised by me since about 5 or 6 days oop. She gets jealous over the new babies and wants all of mommy's attention at all times. I seriously have never ever seen a glider like Daisy. The bond we have is beyond anything I have ever had with any other animal. She is also one I can show off to anyone...she lets pretty much anyone hold her, loves little kids has a big fondness for any man. If anything ever happens to my baby Daisy I will be beyond devistated. We just got our new little encore and she is being a sweetie but still a bit scared so I spend a lot of time talking to her but only hold her for a few minutes a few times a day so she can ghet used to me. The noise of the kids and baby still scare her so we're trying to get her used to me before she is bombarded with all the others. 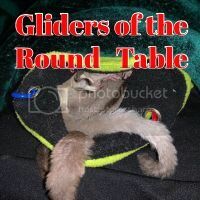 I try to get each of my gliders out every night for play time, but some nights that doesn't happen. No matter what, everyone gets out for at LEAST 15 minutes on me and my sister to have their nightly mealworm feast. Your life was short lived, but your memory will last forever. Mine get out at least every night to run around on me or sit with me in my hoodie and watch some TV while its snack time. 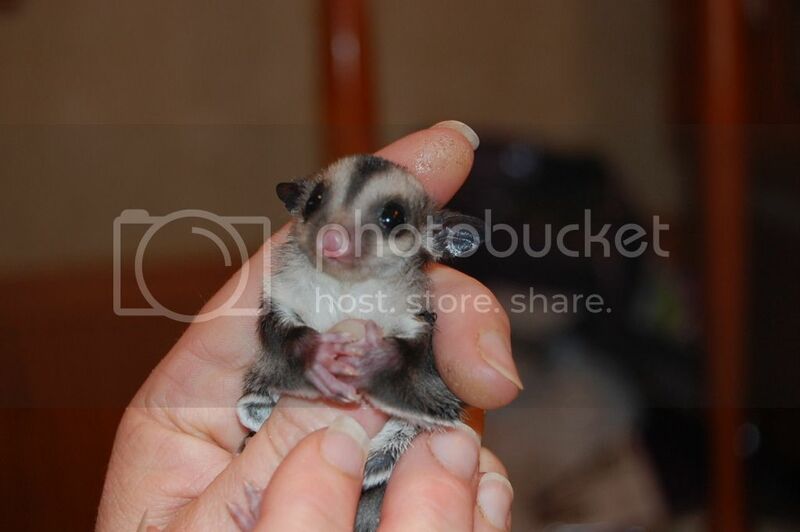 But they get play time in the glider proofed bathroom at least 3 times a week for around 2-3 hours. It's a long time to spend in the bathroom with them but I just take in my laptop and they go to town playing on the PVC stand and using me as a launch pad. i would say they get 1-2 hours out in playtime and this happens 4-5 nights a week. however, i always give them treats in the morning in their cage and they jump onto me to eat them. What does your PVC stand look like? Do you have a photo? I dont want to hijack the thread but if you have time or know where i can google an example please share. I'll admit we don't have a schedule. It depends on how each day is going. It depends on the time of year for me. I work a seasonal job so during peak lobster season (late summer/early fall) they don't get as much actual night playtime as I'd like. But I honestly think they understand, in a way, that their mum is tired. I always make time for them every day, even if I've worked 14 hours, to hand out treats and cuddle. But this time of year I am off work so they get out practically every night! I love this time of year. I can live/eat/sleep/breathe glideritis and I LOVE it. Mine get out at least for a few minutes a night if only for treats. I was recently given a tent( I used to use a glider proof bath room) and they've been able to be out at least a half hour a day. As for how bonded it depends on the glider. Cebastion is a lover and is out all the time so he is really tame but visits anyone. Kali is my newest glider and is getting really bonded this last week she has started demanding attention lol, she barks and makes a fuss till I take her out and then she just sits with me and grooms me. Then I have my breeding pair Joey and Puckett and it depends on if they have joeys or not when there are no joeys they act more bonded to me but once they have joeys they are more focused on each other so don't seem as bonded. 1 registered members (Chase), 15 guests, and 43 spiders. 20,217,736 I just found a lump on Timmy's chest--HELP!